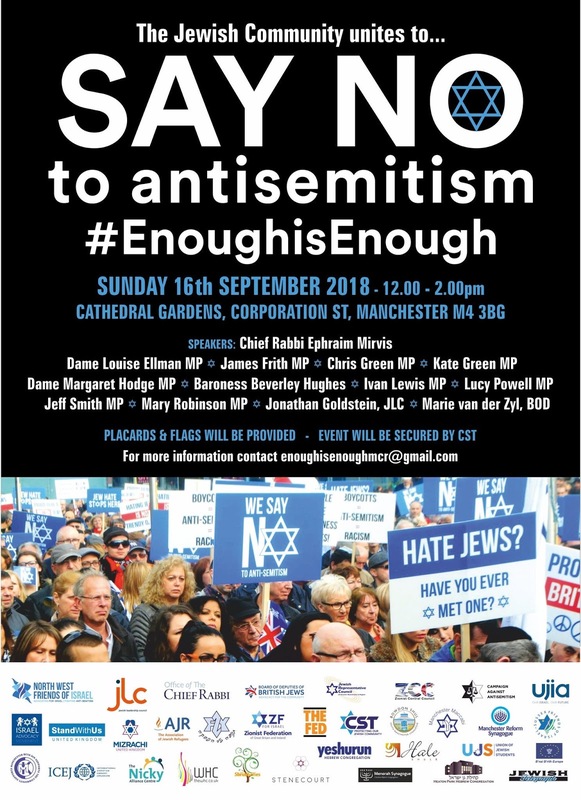 As members of Jewish Voice for Labour in the North West, we welcome genuine efforts to combat rising antisemitism,and indeed racism in all its forms. Antisemitism exists in all parts of our society and,together with almost all forms of racism in the UK, there is some evidence that it is increasing. However, we harbour a great deal of scepticism and concern with regards to the demonstration today. For the last three years there has been a concerted effort to discredit and unseat Jeremy Corbyn as Leader of the Opposition, a man who is quite possibly the most consistent anti-racist leader the Labour Party has ever known. This campaign has been led by a coalition of groups which are deeply opposed to Jeremy's championing of Palestinian rights together with political opponents many of whom have shown little previous interest in combating antisemitism. Rather than seeking to oppose genuine anti-Jewish hatred, they have cynically sought to amplify and manipulate the anxieties of British Jews in order to further their political aims. 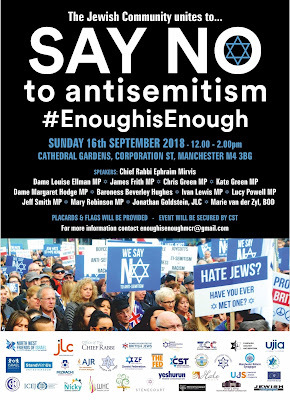 Many of those organisations and individuals taking part this Sunday, including Margaret Hodge, Louise Ellman and the Board of Deputies,are the same instigators of the campaign against Jeremy, and purport to speak on behalf of “The Jewish Community”. There is no such thing. Jews in the UK are extraordinarily diverse, of every complexion and political persuasion. That progressive Jewish organisations, including those supporting Palestinian human rights, were excluded from participating suggests that the organisers and speakers are not acting in good faith. After all, antisemitism affects us too. For some of the headline speakers, however, the demonstration is not just about antisemitism. Rather it concerns the uncritical defence of some of the actions of the Israeli government whilst giving voice to those who want to remove Jeremy Corbyn,a consistent and principled supporter of Palestinian rights, as leader of the Labour party. We cannot emphasise enough that they do not speak for us. Whilst we understand the anxiety that many Jewish people must be feeling after seeing shocking and frequently misleading claims in the Jewish press and the mainstream media about the Labour Party and Jeremy Corbyn, it is important to note that racist attacks on other groups such as Black and Asian people are far more prevalent. We would like to see a united campaign of Jews and other minority ethnic groups against both antisemitism and racism in it various forms.Jewish people have always been at the forefront of the labour movement, campaigning against racism in all its forms and that remains our commitment as Jews in the Labour Party.Labour has been a welcoming place for us and we do not recognise its description as a hostile environment for Jews. It is still the party for those fighting racism, and antisemitism, in stark contrast to the Conservatives. The recent furore over the adoption of the IHRA definition and examples into the disciplinary code has been seriously misrepresented. The author of the IHRA, Kenneth Stern, an American-Jewish academic and self-avowed Zionist, has testified before the US Congress that it should not be used as a tool to combat antisemitism because of the likely impact on free speech. This view is supported by many eminent lawyers who have analysed it including Hugh Tomlinson QC, Geoffrey Robertson QC, Benedict Birnberg, and former Court of Appeal judge Stephen Sedley. The cross-party Parliamentary committee also warned it would need to have free speech safeguards added, and only 6 of the 31 members of IHRA have adopted it (three of them with a dubious record on tackling antisemitism). It has been used already at 2 North West Universities to curtail debate on Israel/Palestine. It is,therefore,wholly unreasonable to criticise the party for wanting a free speech clause in accordance with the Human Rights Act. This is essential to protect the rights of Palestinians and others who must not be silenced. Demanding that the human rights of Palestinians be respected should not be equated in any way with anti-Jewish hatred or denying ourselves the right to self-determination.